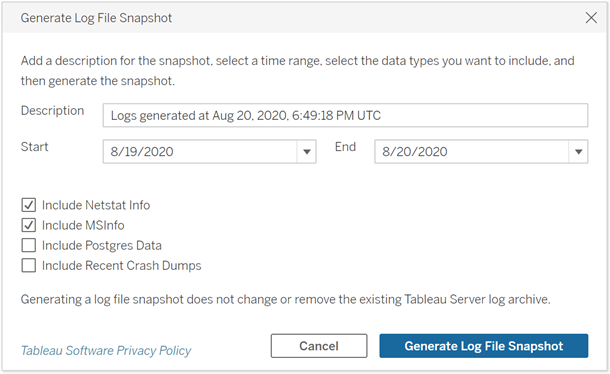 Tableau Server includes functionality to generate a snapshot of log files for archival purposes. If you plan to clean up and delete old log files as part of regular server maintenance, you may consider archiving log files to an off-server storage location before deleting them. Note: For instructions about collecting logs on older versions of Tableau Server for Windows, see the archived online help on the Tableau Help page. Or, if you are working with Tableau Support on a case, the support engineer may request a server log file snapshot. Generate a log file snapshot. On the Server Maintenance page, under Log Files, click Generate Log File Snapshot. On the Options page, enter or select the options you want, including a Description, time Range of log files to be included, and the optional types of logs to be included (Include Netstat Info, Include MSInfo, Include Postgres Data, Include Recent Crash Dumps), then click Generate Log File Snapshot. The log file snapshot is saved to a fixed location on the computer where TSM and Tableau Server are installed. If you have a multi-node installation, the snapshot is saved to the initial node of the cluster. The location is specified by the basefilepath_log_archives variable. You can find the current location by querying the basefilepath.log_archives setting, and change the location by specifying a new value for basefilepath.log_archive. For more information, see tsm File Paths. To download a local copy of the snapshot or to delete it, select the snapshot under Log Files and then select the appropriate Action. Select the snapshot you want to send. Click Upload to Technical Support Case. In the dialog that displays, enter the Support Case Number and your Contact Email Address, then click Upload Snapshot. You create a snapshot archive of Tableau Server log files using the tsm maintenance ziplogs command. By default, this command creates a zip file containing all of the log files. If you are running a distributed installation of Tableau Server, perform this step from the initial node. Logs from all nodes will be included in the zip file. where <filename> is name of the zipped archive file you want to create. Choose a unique name with no spaces. If an existing ziplog with the same file name already exists the creation of the file will fail unless you include the -o option to force an overwrite, delete the existing file, or specify a different name in the command. You can specify a time range for the snapshot and you can also specify which types of logs to include. For more information, see tsm maintenance ziplogs. 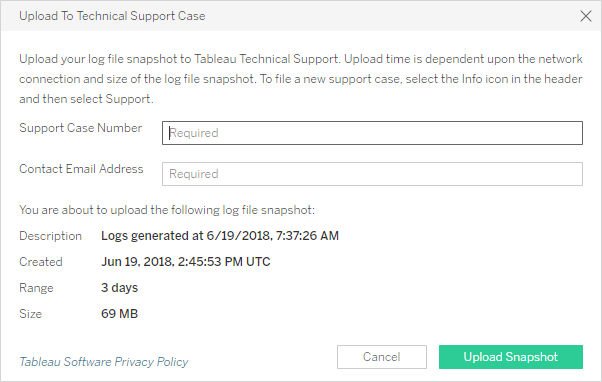 You can send log files to Tableau Support as a part of a customer support case (a customer support case number is required). Before sending a log file, use tsm maintenance ziplogs command to combine the log files into a single zip file archive. If you are creating the archive to send to Tableau Support, see the Knowledge Base for information about how to upload large files. where <case number> is your support case number, <email address> is your contact email for this support case, and <zip file name> is the file name of your archive with .zip file extension.